For fifty years the name on the front door has read "Rodgers & Hammerstein." Five years ago, when their music publishing firm was brought in house, a plaque for "Williamson Music" was added. But in June of 1990 a third sign went up on the front door, "Irving Berlin Music Company." One might ask: What is the Irving Berlin Music Company doing here? When Irving Berlin died at the age of 101, he left behind an astounding legacy of well over 1500 popular songs including numerous scores for both motion pictures and Broadway. Since he was known to keep a tight reign on all his music, and since he ran The Irving Berlin Music Company himself until the day he died, his heirs had to determine the best manner in which to protect, preserve and promote this body of work. While it at first appears unlikely, it is perhaps inevitable that the musical legacies of Irving Berlin and Rodgers & Hammerstein would be housed under one roof. Lifelong colleagues and friends, all three men shared a deeply-held belief in managing their own businesses to service their own copyrights, built on the premise of writers protecting their own work. While Berlin ran his company, Rodgers & Hammerstein set up Williamson Music with Chappell Music, which provided administrative services so the team could focus on writing and their other interest: producing. In addition to presenting their own musicals, the team decided to produce the works of others as well, and by far the most successful of these was Berlin's ANNIE GET YOUR GUN. 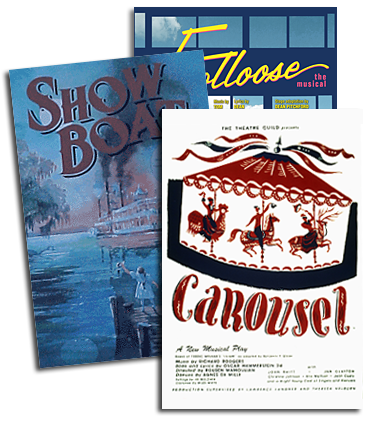 The show has resided at R&H since the beginning and is, to this day, one of the most popular titles in the R&H Theatre Library catalogue. Following Berlin's death on September 22, 1989, his three daughters - Mary Ellin Barrett, Linda Emmet and Elizabeth Peters - and his executors began to consider how the Berlin catalogue could be administered without him. The key was to find a suitable enterprise capable of handling his widespread interests in music publishing, theatre, film and related fields. As it stands today, The R&H Organization proved ideal: with its consolidation of stock & amateur theatrical rights, music publishing, concert, legal counsel and promotion, it could service the Berlin interests completely and immediately. Early in 1990, negotiations began to bring Berlin into R&H. Not only did pragmatic business concerns play a key role in this process, but so did longstanding family relationships. Rodgers, Hammerstein and Berlin had been part of the same social and professional circles for years, and their wives and children knew one another as well. The Rodgers daughters and the Berlin daughters attended Brearley School at the same time; Mary Rodgers recalls that after one particularly spirited playground debate she came home to ask of her mother, "Who is more popular - Daddy, or Irving Berlin?" ("Irving Berlin" was Dorothy Rodgers' response.) Mary Ellin Barrett recalls a time in college when she joined her father and his associates for dinner in Philadelphia during the tryout of ANNIE GET YOUR GUN; she sat beside Richard Rodgers who spent the time giving the young college student invaluable advice that helped get her future on track. The administrative arrangement between the Berlin estate and R&H was announced in June 1990. Since then, the R&H Organization has worked in all of its divisions to increase the visibility of the Berlin catalogue in ways that are sanctioned, and in some cases prompted, by his family. Williamson Music now oversees the music publishing and licensing interests of the Berlin catalogue, The R&H Concert Library promotes Berlin concert arrangements, and The R&H Theatre Library administers the theatrical rights to such classic musicals as CALL ME MADAM and THE COCOANUTS, as well as continuing with ANNIE GET YOUR GUN. In 1991, the first authorized collection of Berlin songbooks was published, categorized by subjects that Mr. Berlin himself had contemplated in the '40s but never acted upon. Another accomplishment has been the licensing of several Berlin revues around the country - most notably last summer in Chicago and San Francisco, and upcoming this spring at the McCarter Theater in Princeton, New Jersey, and once again in Chicago. Berlin standards have been featured in such recent motion pictures as GRUMPY OLD MEN ("Heat Wave"), SCENT OF A WOMAN ("It's a Lovely Day Today"), GLENGARRY GLEN ROSS ("Blue Skies"), and the blockbuster HOME ALONE ("White Christmas"). In the pop music arena, Phil Collins recently released a version of "Always" for Atlantic Records, and half a dozen Berlin tunes appear on Tony Bennett's latest release, STEPPIN' OUT (Columbia). "White Christmas," a seasonal favorite since Bing Crosby introduced it in the film HOLIDAY INN in 1942, has received special attention since the Berlin catalogue came to Williamson. In 1991, a commem-orative sheet music edition was published, with Grandma Moses' painting of the same title gracing the cover. The following year, Michael Bolton, Garth Brooks and Mel Torme each observed the song's 50th anniversary by including it on new albums. And in 1993, half a dozen artists from almost every imaginable genre released recordings of "White Christmas": Aaron Neville, Gloria Estefan, Vince Gill, Barbara Cook, BeBe and CeCe winans, and David Foster. ANNIE GET YOUR GUN remains as popular as ever. The R&H Theatre Library licenses over 450 productions annually in the U.S. and Canada alone; a studio recording starring Kim Criswell and Thomas Hampson, conducted by John McGlinn, was released by EMI Records in late 1991; a U.K. revival starring Criswell and John Dierdrich opened in London in 1992; and a U.S. national tour starring Cathy Rigby, directed by Susan H. Schulman, began at the Houston Grand Opera in July, 1992, and toured the United States for a year and a half. Ultimately, the relationship between Berlin, Rodgers and Hammerstein is a deep one, founded in shared history and mutual respect: "We wanted to be here," says Mary Ellin Barrett, "and the Rodgers and Hammerstein families welcomed us in."